At its core, ShabbatUK harnessed the goodness and uniqueness of a traditional, authentic Shabbat and invited Jews around the country to celebrate it in a way they never have before. Shabbat is a central part of what it is to be Jewish. It plays a crucial role in Jewish identity with its powerfully uplifting and transformative qualities. The Chief Rabbi called on Jews across the UK, regardless of their level of religious observance, to celebrate a Shabbat unlike any other, on the weekend of Friday 24th October and Saturday 25th October. Everybody participated in ShabbatUK, from the most observant Jews to those who may have never experienced the beauty of a Shabbat. It was about reaching out to people and inspiring communities. Some kept Shabbat, perhaps for the first time, others participated in the numerous communal events that took place. Many found ways to bring Shabbat into their homes, whether by lighting Friday night candles, blessing their children or by inviting others into their home to share the Shabbat experience. 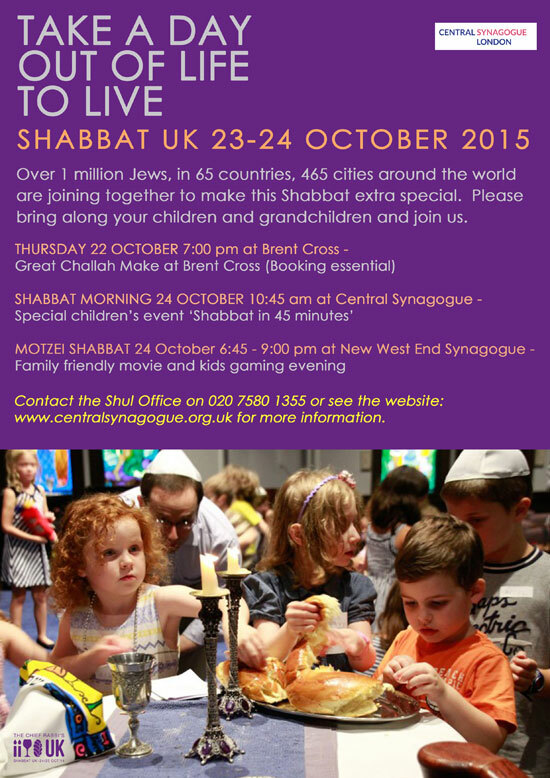 Synagogues, Jewish schools and other Jewish organisations planned a series of events to mark ShabbatUK. This was an incredible opportunity to join with fellow Jews around the world, inspired by the South African Shabbos Project, to experience life, for just one day, disconnected from the daily grind and engage with Shabbat in a meaningful way.